Gilead (NYSE:GILD) is already raising prices on its new HIV meds in anticipation of its patents falling off in 2018 and 2021. 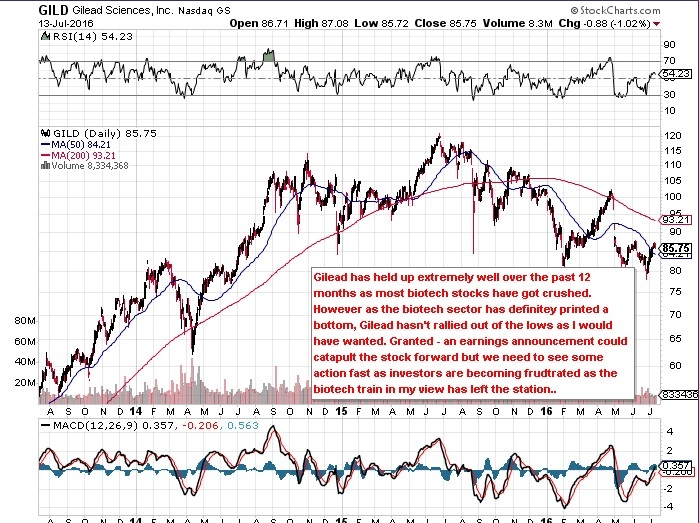 Furthermore the stock’s valuation is cheap meaning that if biotech continues to rally, Gilead will have to get in gear at some stage. The company simply has excellent margins and should blast past $100 a share within the next 12 months. However the dilemma is whether the stock will outperform the biotech index (NYSE:IBB) which is also undervalued n my opinion. The index is more expensive on a valuation basis but has been outperforming Gilead by some distance over the last few months. Can and will Gilead respond?? This entry was posted in Trading and tagged gild, ibb. Bookmark the permalink.